Escape Music is pleased to announce the release of a Robert Hart double album retrospective. 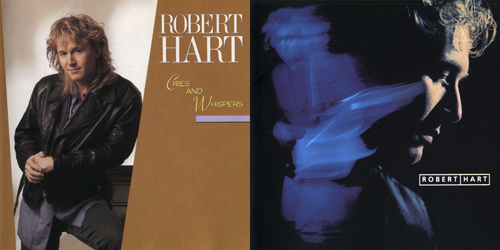 The vocalist for Manfred Mann's Earth Band, Bad Company and The Distance), Robert Hart's two acclaimed solo albums are – Cries and Whispers and Robert Hart. Both albums are now to be released as a two CD Set – plus *2 bonus tracks fully re-mastered will be released in Europe June 21. Track List: Cries and Whispers: White Lies And Promises / Heart / Dear Mary / Such An Easy Revolution / Cries And Whispers / This Has Got To Be Love / A Little Love Is Overdue / Mankind / High On Love / One To One / She's On The List / Heart-Arty Olive Mix / *Your Hurt As Much As Love Someone (bonus track). Robert Hart: Heart And Soul / Angel / Ridin' On The Wind / I Don't Want To Be Here When You're Gone / Boys On The Corner / Fooled Around And Fell In Love / Someone To Watch Over Me / Better Than The Rest / Running Man / A Little Love Is Overdue / * Faster Than The Speed Of Love (bonus track). The 2CD set will be packaged in a deluxe digipack along with full booklet and lyrics to every song. Robert Hart is a British Rock Vocalist and songwriter. His career has seen him play with the likes of The Distance, Bad Company and Company of Snakes, as well as the Jones Gang and more recently Manfred Mann's Earth Band. His recording styles have varied and he can range from West Coast to Blues Rock to Hard Rock, such is his ability. In 1989 Robert recorded a solo album "Cries and Whispers" which can be described as prime time AOR and has been a highly sought after recording ever since. The Album was originally released on Atlantic Records with Stewart Levine at the production desk. Three years later Robert was the first recording artist to be signed by Hollywood Records which was owned by Disney and had the pleasure of working with the great Russ Ballard. The resulting album "Robert Hart" charted in more than 18 countries and it was a great AOR Rock Album that got him noticed by Bad Company's Mick Ralphs who then asked him to front Bad Company following the departures of Paul Rodgers and Brian Howe. In 1995 Robert Co-wrote the album "Company of Strangers" and he has since become a household name in Rock Circles. These two albums in one package are a dream comes true for all fans of hard Rock and AOR, and it "essential" list should be placed on the "as soon as possible! At the moment Robert Hart is working with Jim Kirkpatrick (FM guitarist) on a new project name Diesel and is due to be released in autumn 2013. WebLinks: www.Escape-Music.com.